I only have one card today, but I've already peeked Bountiful Blessings in THIS post here as well as yesterday's post. I don't have much to say because the set really speaks for itself! 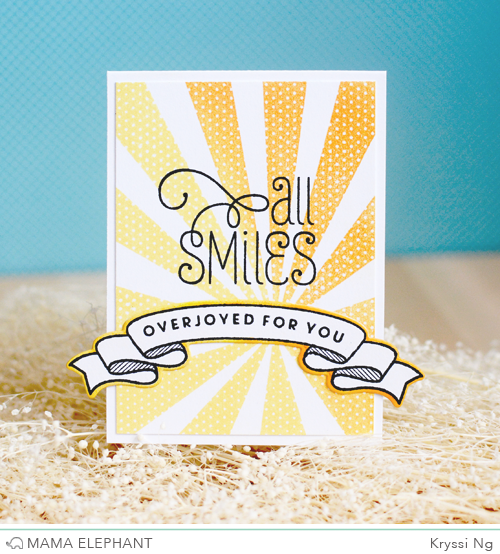 A swirly, fancy yet simple sentiment set for all the upcoming joyous celebrations! When I create my First Looks projects, I try to stick to one set that I'm focusing on. But I have to tell you that all 4 sets we're releasing this month work so flawlessly together, it's hard to not reach out to them and mash them all together! So, in this mini card today, I'm showing you more of the banner from Bloomsies as well as the awesome large scaled polka dotted sun rays stamp from My Sunshine. I just love this little card, it measures just under 3" x 4". It's super cute and packs quite a punch of sunshine and happiness, don't you think? What an amazing font! Can't wait until these goodies become available. Ooooooh!!! Soooooo pretty! Must have!!! I love the gradation of the yellow in the rays. Beautiful card. Happy, happy, card! Love it! LOVE this card!! Can't wait for this release. Wonderful card. Can't wait to see the rest of the release. Very sweet script and banner design. Adorable--love it! The banner is wonderful and the sun, of course, perfect! Oh, what a wonderful sun! Katy, it's a commercial font that anyone is free to purchase. Adorable images....love the little kids. Great card! Love the yellow/orange sun rays. I've been thinking I need the My Sunshine stamps. Now I know I do. ...they are all so cute! I love all of your new stamps! !